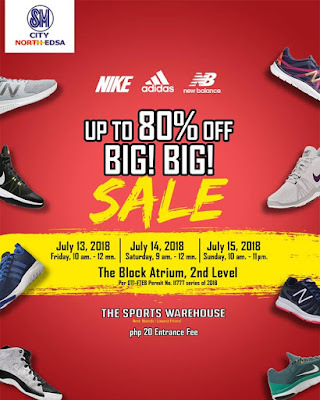 The Sports Warehouse's UP TO 80% OFF BIG! BIG! Shoe SALE goes to The Block Atrium, 2nd Level SM City North EDSA on July 13-15, 2018! Enjoy exclusive offers and great deals on select Nike, Adidas, and New Balance footwear!